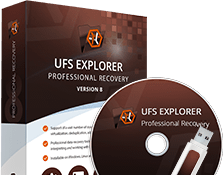 UFS Explorer Professional Recovery is an advanced data recovery software application created to be of use for data recovery professionals and technical specialists. Augmented with thorough data structure analysis and full-scaled data recovery algorithms, the software is capable of solving even the most complicated data recovery tasks. An embedded RAID Builder mechanism allows building RAID of different levels, including nested ones and custom RAID configurations, while a set of decryption techniques enables data recovery from encrypted storages utilizing full-disk encryption, BitLocker, LUKS, Apple FileVault 2, eCryptFS, etc. The software can be installed on several operating systems – Microsoft Windows, Apple macOS and Linux and supports a wide range of storages, including virtual machines of different vendors, RAID-based NAS, SAN, Drobo BeyondRAID, RAID-Z, and various file systems applied on them. 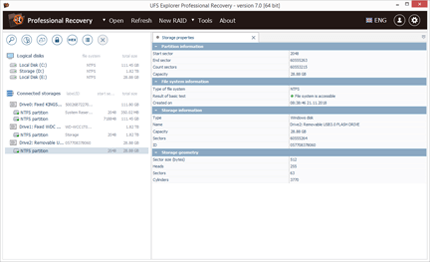 UFS Explorer Professional Recovery is adjusted to work with file systems on disk images, virtual disks, RAID storages, NAS, hard drives, USB flash drives, memory cards, etc. without the need for prior scanning. Created for professionals, the product requires at least basic user experience and computer literacy. 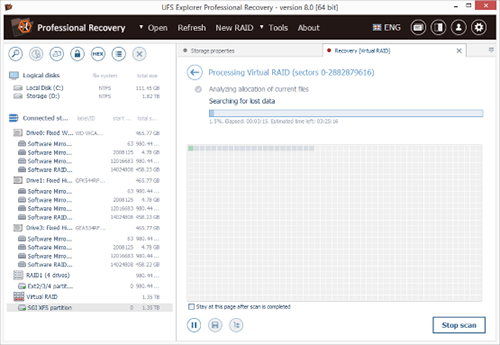 The software supports virtual building, reading and data recovery from RAID. Automatic reconstruction of mdadm, LVM, Apple Software RAID, Intel Matrix, etc. Support of most popular standard RAID patterns for RAID 0, RAID 1E, RAID 3, RAID 5, RAID 6, RAID 7, etc. RAID-on-RAID support: RAID level 10, 50, 60, 50E, etc. The software is able to decrypt encrypted storages. The software is capable of working with disk images and virtual machines. The software is capable of detecting and working with a wide range of modern storage technologies. The software will copy files with the size below 768 KB. To install the program, download the installation file. Make sure that your computer meets the minimum technical requirements before running the file. 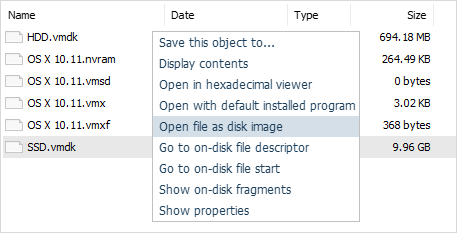 If installation does not start automatically, browse the Downloads folder for the program setup file, the name of which usually contains the name of the software, e.g. ufsxpci.exe. Open the file with Administrator privileges or enter the administrator password, in case you are an ordinary user of PC. Start the installation by following the prompts. 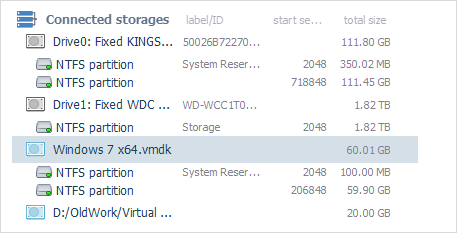 After launching the program, you will see the navigation tree on the left side of the tab where all detected storages will be shown together with partitions, disk images and complex storages (RAID). You can either choose the needed storage from this top-level structure or use the Open button on the upper panel. In case you don’t see the needed storage, press the Refresh button to reset the tree of the attached storages. Double-click the storage to browse through available files and folders or press the Start scan button to proceed to data recovery. All UFS Explorer products are created as shareware. Therefore, one can try the program before purchasing a license for it. It’s strongly recommended to test the trial version and evaluate the results of recovery. 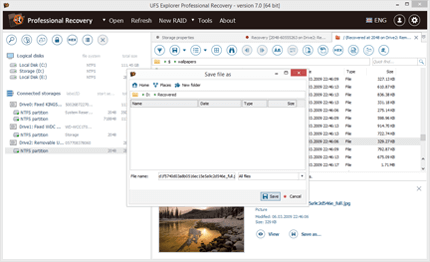 UFS Explorer Professional Recovery supports recovery from a wide range of file systems applied in Windows (FAT/FAT32/exFAT, NTFS and ReFS/ReFS3), macOS (HFS+, APFS), Linux (Ext2, Ext3, Ext4, SGI XFS, JFS, ReiserFS, Sun ZFS, Btrfs), BSD/Solaris (ZFS) and VMware (VMFS, VMFS6) along with providing access to files on Novell NWFS, Novell Storage Services file systems. The software also works with the technology of Microsoft data deduplication (Windows Server), allowing users to search for NTFS and ReFS volumes with enabled deduplication and recover data lost from the them. 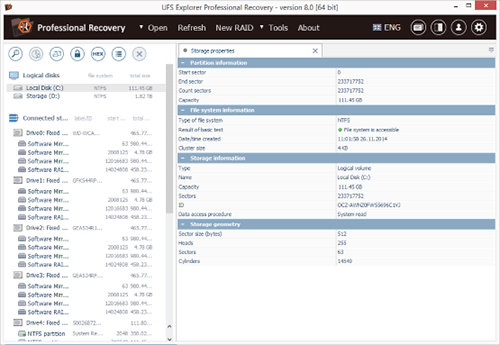 UFS Explorer Professional Recovery works with standard, nested and custom RAID configurations. The application supports assembly of non-redundant RAID level 0 and JBOD, 1 and 1E mirrors, levels 3 and 4 with dedicated and 5 and 6 with distributed parity. Special syntax enables setting up custom RAID configurations with different data distribution algorithms. 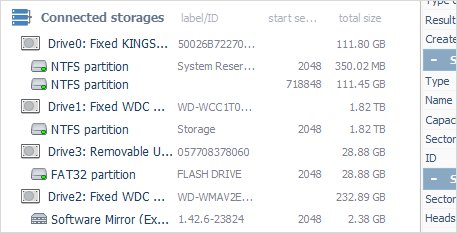 The software supports adaptive reconstruction of RAID storages with damaged sectors using parity (for RAID 5 and RAID 6) or a copy of data (for RAID 1). A RAID storage can be also reconstructed using disk images with the imitation of bad sectors with help of bad sector maps. 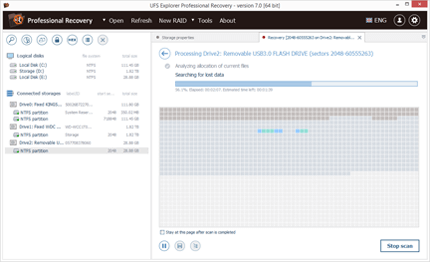 In addition to support of various RAID-based storages, UFS Explorer Professional Recovery is capable of recovering lost data from Drobo devices, like Drobo 5N, Drobo 5D, and Drobo FS, which apply BeyondRAID, a highly innovative redundant storage technology. The software works with full-disk encryption, including LUKS, FileVault 2 and BitLocker, providing the possibility of access and recovery of files from encrypted volumes in cases when the encryption key is known. The software also supports other encryption technologies, such as APFS volumes encryption and eCryptFS. Data recovery from the encrypted storages is possible when the encryption key is known to the user. 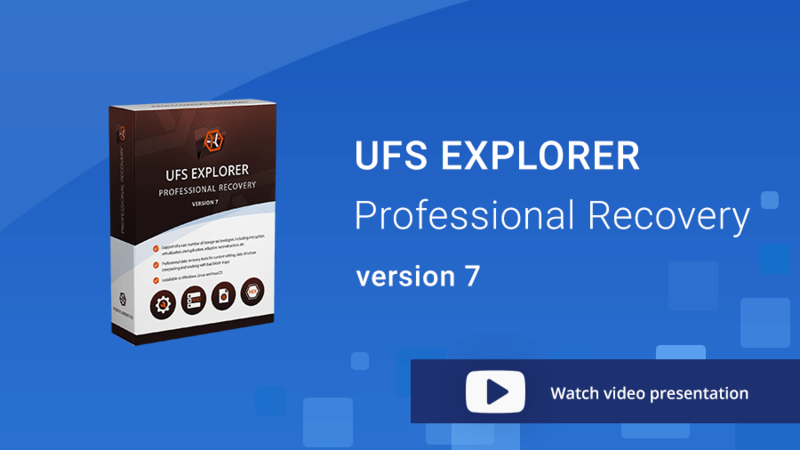 UFS Explorer Professional Recovery applies cutting-edge algorithms in the process of restoring lost or deleted files and efficiently works with various storage technologies, including Apple Core Storage, LVM Thin Provisioning, XEN Server LVM, Synology iSCSI, etc. With this application you can also easily build RAID storing VMware ESX virtual machines (VMFS file system), open a virtual disk directly from VMFS and recover data straight from the virtual machine without the need to extract the virtual disk first. 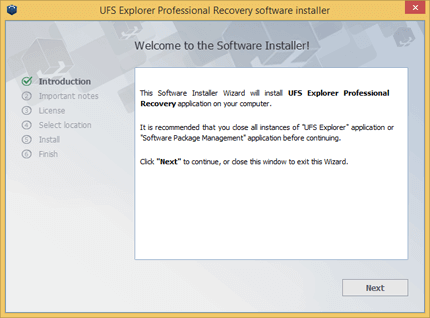 UFS Explorer Professional Recovery supports bad sector maps created by ACE Lab software. 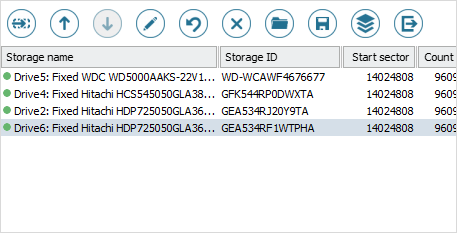 This allows the program to define damaged sectors on the storage using these bad sector maps, so that users could analyze them and get a report on files damage in the process of copying files. What is more, the software provides the possibility of dynamical definition of virtual bad blocks on a disk image through recognition of a given pattern. 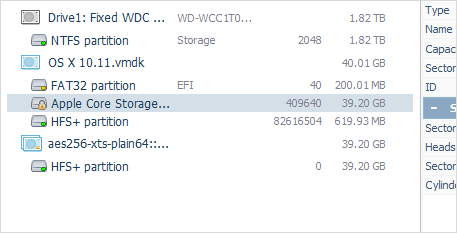 While a typical sector size of a hard drive is 512 bytes, some vendors, like NetApp, EMC, HP, etc. use proprietary block formats in their storage systems which makes it impossible to access data on such disks without specialized hardware. UFS Explorer Professional supports SCSI and SAS drives with a non-standard sector size (520 bytes, 524 bytes, 528 bytes and others) and performs automatic sector conversion in the conventional size of 512 bytes through metadata truncation for subsequent data recovery or access to files. 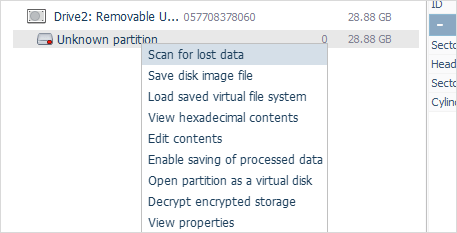 The utility effectively works with various linear storage devices, including internal as well as external hard disk drives, USB flash drives, memory cards and many others, thus serving as an essential data recovery tool for handling most typical cases of data loss, like accidental deletion of files, storage formatting, malware attack, hardware or software malfunction, etc. 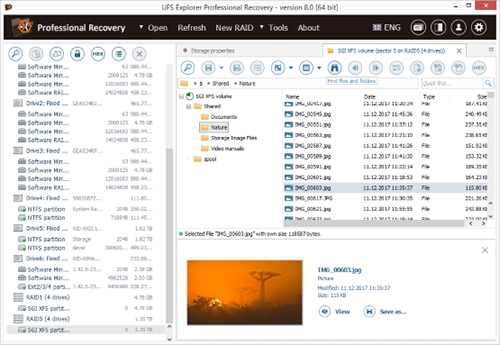 UFS Explorer Professional Recovery is an efficient solution for restoring data from RAID of different complexity, both software and hardware, and various RAID-based storages, like NAS. Moreover, the software supports custom RAID configurations and makes it possible to perform data recovery from Drobo devices which apply BeyondRAID as the primary storage technology. The software is enhanced with a wide support of modern storage technologies employed in different environments, such as Apple Core Storage, LVM thin provisioning, Logical Disk Manager, MS Storage Spaces, etc. which significantly expands the list of target devices the program can be applied to. 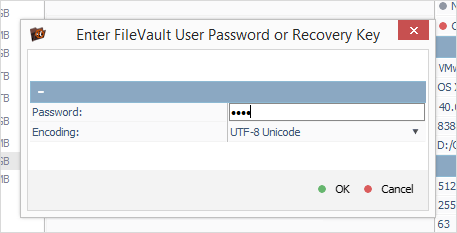 Access or restore files from encrypted storages: LUKS, FileVault 2, BitLocker, APFS, etc. The application is able to decrypt disk volumes for data recovery and data access purposes (if the encryption key is known). The list of supported methods includes LUKS, FileVault 2, BitLocker, encryption of Apple APFS volumes and eCryptFS. 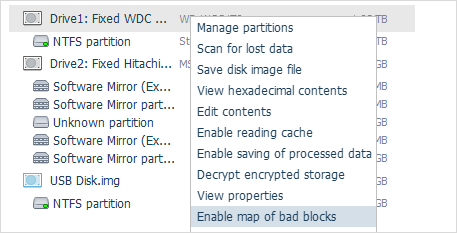 The application gives the possibility to recover data from storages which contain damaged sectors with maximum efficiency by reading bad sectors maps generated by ACE Lab software. The user can analyze the information and get a report on files damage in the process of copying files. Both stand-alone storages and ones combined into a RAID system are supported. In addition, virtual bad blocks can be dynamically defined on disk images through recognition of a given pattern. 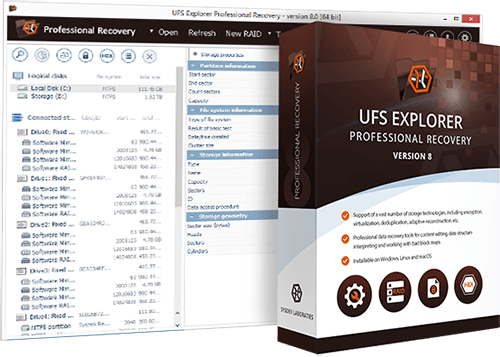 UFS Explorer Professional Recovery effectively deals with disk images and virtual disks created by major virtualization software, like VMware, Microsoft Hyper-V, VirtualBox, QEMU, XEN, etc. and successfully copes with data recovery from such storages as though they were ordinary physical devices. The software is capable of imitating work of virtualization software and consequently provides access and restores files from multi-level virtual storages with no additional operations required. For example, the user can scan a virtual disk stored inside another virtual disk and promptly retrieve files that were lost or deleted from it.